8 Small Bathrooms You'll Love! How can you make a difference to your home when it is so small? You probably know the answer before even clicking on this article: by being very creative! Yes, when it comes to decor there are few things more challenging than decorating a place with little space. We need to look at great examples of how experts have done it in the past or rely on excellent professionals to help us out. Luckily, we at homify are here to provide you with an excellent space to look at beautiful designs from around the world, all made by professionals who can also be found on this platform. Here you will always find excellent examples of homes, rooms and gardens along with brilliant tips for alternative decor and design. Today we are going to look at ideas for decorating small bathrooms, which result in the perfect spaces! We are going to explore all sorts of ideas when it comes to finishes, decorative objects and colours, which will be presented to you in the form of colourful images below. You'll have all of the information at your finger tips for transforming your small bathroom into an amazing place. Despite being overlooked often when it comes to decorating, the bathroom deserves special attention. Having a functional and comfortable space for your daily routine will make a huge difference to how you start your day. After all, this is probably the place you visit as soon as you wake up and the place where you relax just before bed time. Come with us, look through our suggestions, write down the ones you like and enjoy soaking up some incredible inspiration for your home. The first tip is to use parts of your decor as an asset to your bathroom. When we encounter small environments, we need to make the most of ambiance. We can opt for many different styles in order to achieve this or work with the features that are already available in the environment. You can opt for vivid colours and softer colours, which gives complementary styles to the decor of the space. In this project, we can see a very elegant composition. Don't you love how the designers have used the available wall space for a large mirror? This is a great option for any bathroom as it makes the space look that much bigger. It's also a very distinctive form of decor that is subtle, working perfectly with the neutral colours. Small environments sometimes call for very large and bold interventions! One of the most creative ways to achieve this is to bring together vivid shapes and geometric shapes. 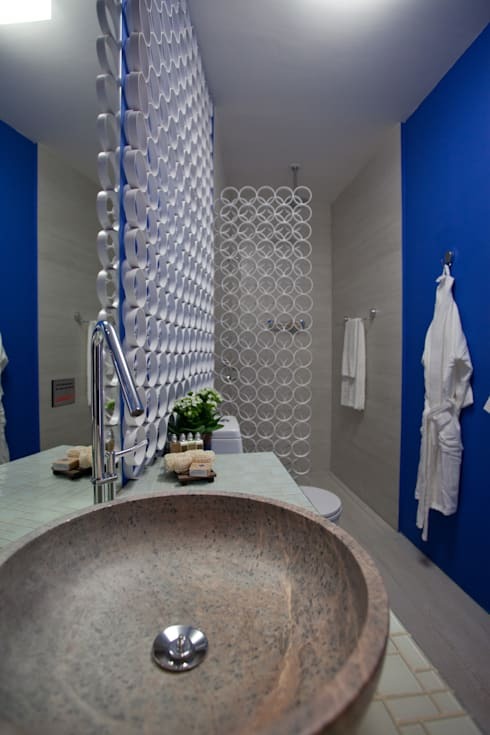 The colours catch your attention and make the size of your small bathroom lose focus. This is a very interesting tip when it comes to increasing the size of your small bathroom. In this beautiful project, we can see how the designers utilised circular shapes of different sized and mixed colours, flitting between vibrant and neutral, bringing perfect composition to the environment. Despite very little space, this room becomes very well-used and a visual treat! Have a look through the homify bathroom products for tips on how to decorate your own bathroom with beautiful and vibrant decor! The comfort and warmth of a rustic style makes a huge difference to the bathroom! Known for its classic beauty, which utilises the environment around it, a rustic style commonly employs wood, like we see in this design. Wood warms up an environment, which is ideal for a small space. For the cold winter months, it's even better! In this home, the whole bathroom structure is made of wood. 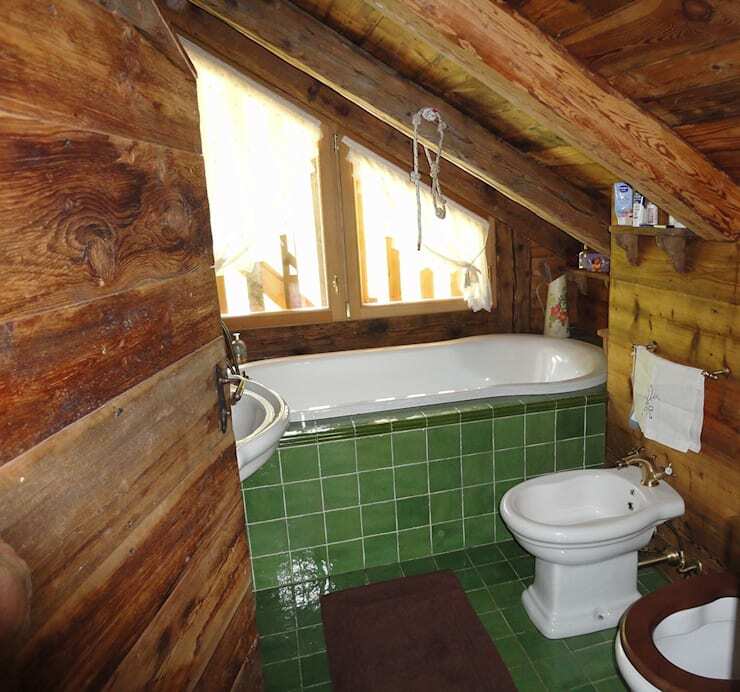 This is because the bathroom has been inserted into the attic space of the house. The beauty of this project is how the wood works in perfect harmony with the green ceramic tiles. This gives the entire room a very relaxed look where you can re-energise! If you like the rustic look and feel, have a look at this: Rustic cottage designed for cosiness. Small spaces need far more organisation. 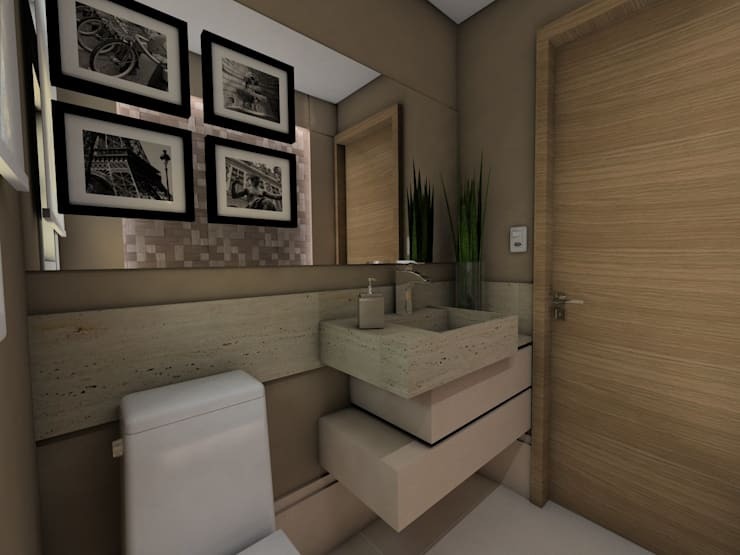 Imagine if in your small bathroom, everything was cluttered, crowded and out of place? This is not a good idea! In this design, we can see how the designers have created a very neat and organised space. In the image, we can see the open plan space is designed with hangers, racks and storage drawers, where everything is neatly organised. The use of white also reinforces the feeling of a clean and organised space. Don't you love the wooden mat that is used to add a warm and earthy feeling to the floor, which is also functional. You won't slip on this! The wooden counter underneath the mirror provides a perfect place to keep towels and personal items neatly out of sight. Have a look at these: Brilliant, beautiful bathroom trends! Use creativity when it comes to decorating, going a bit further than just colours and objects. Bet on lights to make your small bathroom the star of the house! In this image, we can see just how creative you can get with lighting options, highlighting your walls, mirrors and and counter tops in a very unique way. 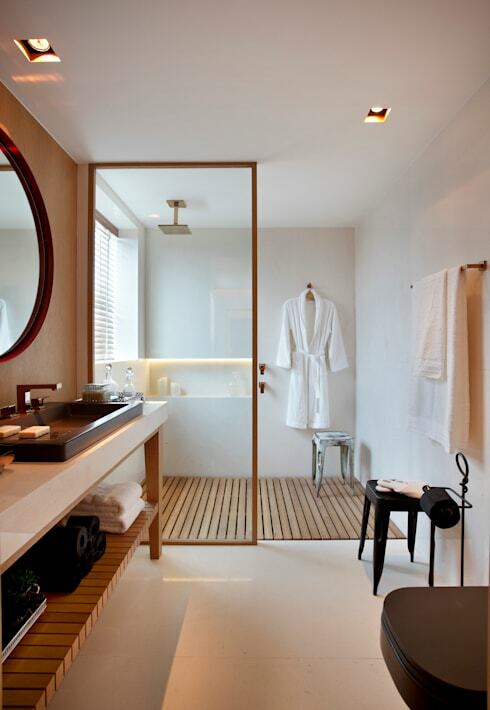 The designers have installed small lights into the bathroom, highlighting the space and enhancing the wooden facade of the room. Innovative ideas will always make a difference to your decor. You can use these innovative ideas for your small bathroom as a way to increase the small space! Remember that when it comes to decor and design, it's important to decorate without fear. A home should represent our personality and flair for style! We can see how beautifully this works in this design. Partitions have been installed, which feature big round hollow circles—how creative and original is this? There is a lot of beauty in the final result. There are so many different ways to create beautiful bathroom walls. You can go for different colours, designs and sizes! However, mosaic tiles, like we can see in this design, are always a great option! 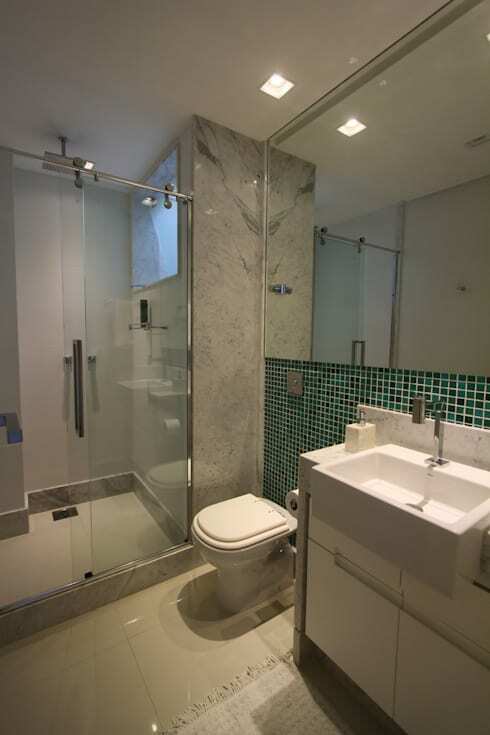 These designers have used green mosaic tiles, giving a special touch the small bathroom. This creates a very charming environment with a touch of personality thanks to the deep, green colour. Finally, we come to this charming bathroom where all of the materials used come together flawlessly. 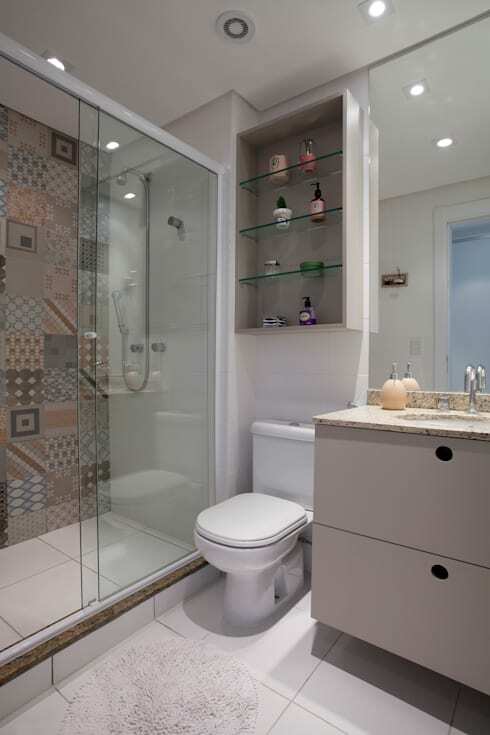 The use of creative tiles gives a special charm to the small bathroom, highlighting the space that is available. This a very easy decor tip to put into practice—all you need to do is find out what kind of ceramics you like! This is the best way to decorate your bathroom—easy and simple! Liked this ideabook? Have a look at this one: Save time (and money) renovating your bathroom.